A short recap of the presentation and the video of the livestream sorted by team. Team two had maybe one of the most difficult questionscases: ‘How can Zoom Media get more depth in the sense of sentiment when analysing data?’. In order to do so team two had to come up with an concept that helps identify multiple facets in order to create multidimensional sentiment analysis. To do so they They have extracted the process in to tree segments: Sentiment, Target group and News. With the combination of these segments Zoom Media can find out if particular parties or groups show a significant correlation with each other and if behavior can be generalized. This data will be gathered in graphs and diagrams which will be get analyzed by human beings. To summarize the whole presentation, it kind of looks like the following process: 1: The video reaches the news – 2: The video goes to Zoom Media – 3: The video goes through the sentiment analyses – 4: the video goes through the target group scan – 5: tags will be added – 6: Humans will check the results – 7: there is a summarized story of a sentiment analyze. Still confused? Check out their presentation below. Team three got the question from the VPRO on how they can increase the traffic on their website and get people to stay longer. They have thought of a concept that analyses the (Big) data from a visitor (their digital footprint) to give them suggestions on what to watch more. This in itself isn’t a new development, but they also use tags of the videos and other data to make sure that the suggestion is fully specified to the person that is watching. So if you were watching a video of the Media Future Week about Post-Truth and you earlier were looking for a book about the same subject, you might get a suggestion of a documentary that’s about Post Truth. This should make people stay longer on their website and also expand their interest field what creates an endless cycle. Therefor they have given this the tag: ‘’Start your journey’’. Team four came up with an enriched platform where millennials can publish stories about a news item. But how do you get people to publish? By giving them extrinsic motivation and by protecting them. The extrinsic motivation comes from ratings in the form of stars and trophies. The more people like their story, the higher someone gets in the general ratings. The save space is created by preventing people to react on a story, so no harm can be done. To make sure that only stories that are really an addition to the website get published, KRO is the final editor that checks every story. Team four emphasize the fact that this idea is timeless no matter what way of information sharing there will come in the future. Watch the full video below. Team number five had the assignment to find a new way to interact with viewers, so they came up with the Tree of Life. This model assumes that the reason people don’t continue watching more episodes is, because they don’t feel a part of a program. People are missing the part in which they can share emotions, thoughts and impressions. Creatives love to create and share things in which they need to be fed. VPRO can do this by letting people in on the creative part of the programming as well as on the pre-on-and post production. In the pre-production the creatives can join the production session with the experts online where they can give input which they can immediately use for the program. On the on-and post production part people can react while watching the video by leaving comments and emoticons. This helps seeing the ups and downs inside an episode. So at the end the viewer is happy which creates loyalty which results in a happy VPRO. A good ending to all. Watch their full video below. Team six had the job to check the possibilities of ethically and lawfully analyse people’s emotional expressions by analysing data which was provided by broadcasters. Therefor they had to find out what the ethical norm about analysing emotions is. They concluded that it’s already being done and only a few people are rising up against this development. Looking at the lawful factor they now know that when people are accepting the fact that they are being interviewed and broadcasted, they have already given the rights to do more or less anything with the data. The only real struggle left is the how. How can you analyse data that you can ethically sell on to marketers? By using emotion recognition guidelines like voice- and face recognition systems that are being checked by human beings. This information goes into a database which creates an association network of the six basic emotions of human beings that can ultimately learn itself to recognise and analyse all human behavioural emotions expressed in video. Learn more by watching the video. Team seven had the assignment to find a new way to bring advertisements to the audience, without finding these interruptive. Meet ‘’Super STER’’. Super STER is an online platform where people have the chance to watch advertisements whenever and wherever they want to. On this platform users can collect stars by watching advertisements. Later on, during their ‘daily business’, the users can skip adds -so they aren’t interruptive- by using the stars they’ve collected earlier on. Learn more by watching their full presentation below. Team eight had the assignment from KRO-NCVR to enrich their platform to create more interaction and co-creation with their target group ‘millennials’. Therefor team eight has developed Pluk. Pluk is an online platform where everybody can publish stories about news items. The homepage of Pluk is an image wall with various sizes of pictures. The bigger these pictures are, the more engaged they are. But how do you get people to publish? By giving them extrinsic motivation and in this case by giving them ratings in the form of stars and trophies. But not everyone is a writer so beside the chance to write stories, you can also upload cohesive images. At the end of the month the best article or the best image will be selected and praised. See their full presentation in the video below. Team nine got the task to find a new way to enrich sports by bringing new possibilities to people at home. Because people sit at home in their living rooms watching a sports match with only one specific commentator talking about it. Therefor if they want more information, they need to contact a second and maybe even a third screen. This should be made easier and so they created the Ziggo-Hub. This app makes it possible to stream content that is usually not being streamed by the broadcaster, but what is a collaboration between the live spectators and the broadcaster. The spectator makes a live-stream which can be followed by anyone and can be commentated/enriched by, for example, a (YouTube)star. The people that follow that stream, can also interact with each other to make it a shared experience. Watch the full video below. Like team two, team ten also had the assignment from STER to come up with a new way of advertising which isn’t interruptive to the viewers. 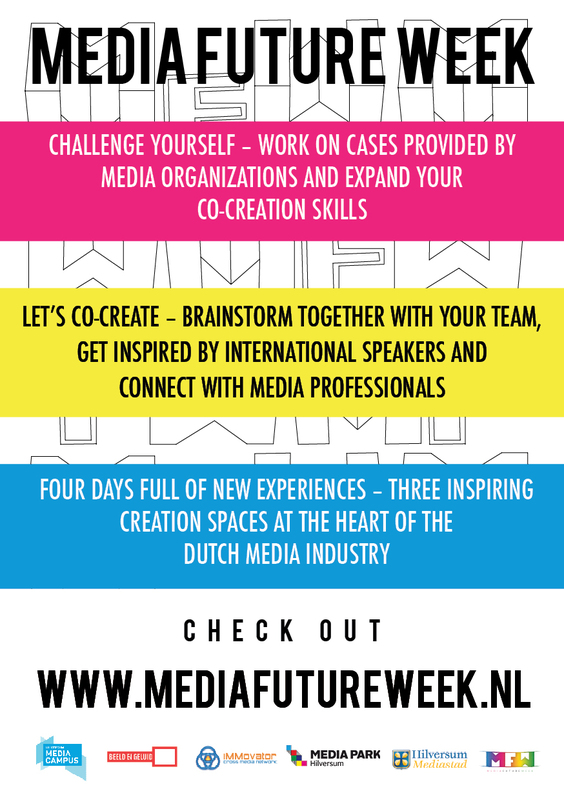 Just like the Media Future Week itself, they came up with an idea that is very futuristic but maybe not unlikely. Team ten came up with a lens that scans neurological waves from people their irises. People ware this lens wherever they go and leave data tracks behind. This will be analyzed to create a path of people their interests, what makes it possible to generate advertisements that are fully corresponding with what they like. So the user generates his own advertorial world. Now it’s up to STER to develop this product. See their full presentation below.